If now 1.... Ne7 then 2 Qxf7 wins a pawn. Now this is good because the knight had moved awayfrom the centre. Black has to eliminate the bishop, but now White's centre is very strong and also the open 'f' file is under control of the white rook. 4...hxg5 5 Rg4 Qe7 6 Rf1 Rd1 7 Qg3 f6 8 e4! Having provoked ...f6, White prepares for 9 ef6 gf6 10 e5! So Karpov makes a bid to activate his rooks. 8...Qa3! 9 ef6 Qxc3 10 f7 Rc8 11 d5! This pawn sacrifice ensures that the 'd' file remains closed, eliminating any counter play by Black. 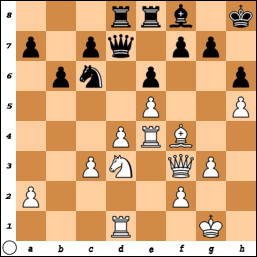 White intends to break through with Rxg5 and h6 with quick mate.